Desert or wild buckwheats (Eriogonum sp. ), members of the Buckwheat family (Polygonaceae), are native to North America with the greatest numbers in the arid regions of the West, particularly in the Great Basin and California. There are about 250 species in total, with at least 17 in Washington and 11 in Chelan County. Almost all eriogonums are perennial and range in size from 4-6” forbs to 24” sub-shrubs. Desert buckwheats have qualities that make them great additions to a xeriscape or rock garden. They are very drought tolerant and often have an attractive rounded or mounding form with a range of leaf textures and colors. The long-lasting flowers are borne above the foliage in colors of white, cream, yellow or pink. 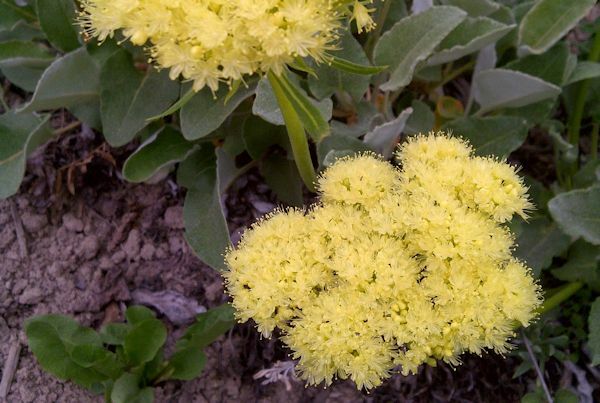 One of our best local natives for the landscape is sulfur buckwheat (Eriogonum umbellatum). It is easy to grow and found throughout much of the West in varied forms; our local subspecies features dark green leaves that turn reddish in the winter and clusters of bright yellow flowers. A larger buckwheat, really a small shrub, is creamy buckwheat (E. heracleoides); it forms a low woody mound up to 20” tall with flowers that are pinkish-red in the bud, opening to a creamy-white. Snow buckwheat (E. niveum) is widespread in the drier eastern half of the state; it is notable for its masses of white to pink flowers that appear in late summer and fall. Northern buckwheat (E. compositum) ranges from the shrub-steppe to well up the east slopes of the Cascades and sports arrow shaped leaves and white to yellow flowers in large flat-topped clustes. Two small and very choice buckwheats for the rock garden are thyme-leaved buckwheat (E. thymoides) and cushion buckwheat (E. ovalifolium). In addition to their beauty in the landscape, desert buckwheats are very important plants for native pollinators, especially butterflies. The abundant, long-lasting flowers are key nectar sources for many insects and the leaves are the primary larval food for many butterflies, especially blues and hairstreaks. The late blooming species, including snow and tall buckwheat (E. elatum), provide nectar for pollinators when such sources are becoming scarce.